"A Remembrance of the men's "Day of Recollection" holy card"
Holy card for a remembrance of the men's "Day of Recollection" held in 1966 at St. Elizabeth Church in Norwood, Ohio. Victor Nieporte served as the preacher. 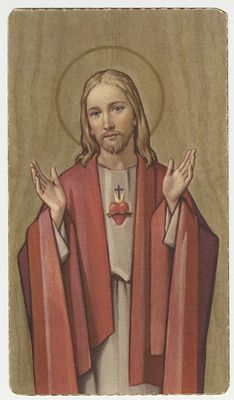 The front of this card contains a portrait of Jesus wearing red and white robes and standing with open arms in a blessing. The Sacred Heart is visible on his chest. The back of the card contains information about the event and a religious call to action (Ortisei 1). This card was made by Bonella Milano and printed in Italy. 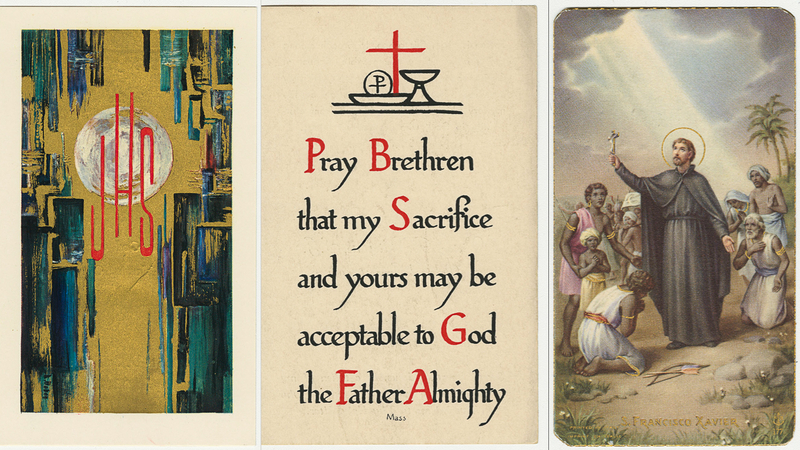 "A Remembrance of the men's "Day of Recollection" holy card" (1966). Jesuit Memorial Holy Cards. 47.